An army of fans surprise Schleicher Hear from AFL Women's ruck Ruby Schleicher and her family as they react the 18 year old's first game as a Collingwood player against Carlton at Ikon Park on Friday. Captain Stephanie Chiocci will be aiming to lead the Magpies to their first win of the AFLW season. Collingwood has turned to experience to help bolster its line up for its second game of the AFL Women’s season on Saturday night. Melissa Kuys, Penny Cula-Reid and Lou Wotton will each represent the Magpies for the first time when they run out against Melbourne at Ikon Park. They replace the omitted Lauren Tesoriero, Ruby Schleicher and Helen Roden. Tesoriero and Schleicher remain on standby as the two emergencies. It’s been a long journey for each of the incoming trio, for each has been playing their trade in the VFLW competition for several years. A hard-working and resilient midfielder, Kuys captained and was a stand out for VFLW club Knox in a poor 2016 season for the club. She is an excellent kick and her run-and-carry game will benefit from a strong program around her. Experienced small defender and captain of the St Kilda Sharks in the VFLW. Cula-Reid intercepts well and makes good decisions coming out of defence. She has been highly influential off-field in the development of the women's game. A former triathlete who retired from footy in 2014 but decided to nominate for the draft after watching the 2016 exhibition series matches. An experienced ruck and twice a VWFL best-and-fairest. Extremely fit and won the club's 2km time trial. “It was great to have 27 players available again after we had several injuries on Friday night,” coach Wayne Siekman told Collingwood Media. “There were four players on the bench at the end who couldn’t come back on, so our medical team has done a great job to ensure that they are all up and about and available to be selected again this week. I think the eight-day turnaround helped us. “We’re bringing in Penny for her debut. He’s an outstanding decision maker and is one of the bets kicks in the team. Last week our disposal efficiency wasn’t great, so it was a pretty easy decision for us. 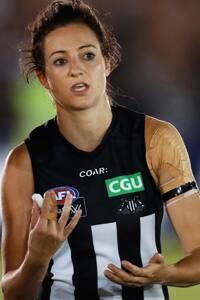 “Lou Wotton, who is part of our leadership group, will come into the ruck with Emma King. She has trained really hard last week since missing out and deserves the opportunity to play against her old side, that she played an exhibition game for. “Our effort at the contest was great. The first half was really physical, strong and aggressive at the football. We just didn’t get the rewards like Carlton got at the other end, and we went into half time at 4.1 to 1.4. It arguably could have been even. All the stats and KPIs that we had showed that we were right in the contest but we just didn’t take our chances.